We make sure our security products to fit your business, file cabinet keys and desk locks installed or replace. 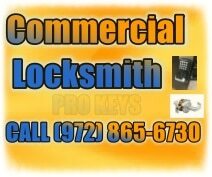 If you have any commercial locksmith needs call us at pro keys Locksmith. We will get the job done right! – High security lock system installation.